Available for Edelbrock single- and dual-quad applications, these oval air cleaners clear HEI distributors and all stock components. Part number 350-1235 fits Edelbrock low profile dual-quad manifolds and others with 6-7/16" carb center-to-center. They come with high-quality 2-1/2" washable, pre-oiled cotton gauze filter for excellent filtration. Overall dimension is 13-1/2" x 7". Edelbrock triple chrome-plated round air cleaners work with all popular 5-1/8" diameter carburetors (Performer Series, Thunder Series AVS, Holley, Thermo-Quad, Quadrajet and Carter AFB). The 10" and 14" models have a knock-out in the air cleaner base for crankcase ventilation (p/n 350-1205 PCV Hose Connection Kit sold seperately). Part numbers 350-1208, 350-1209 and 350-1221 fit all Edelbrock carburetors. 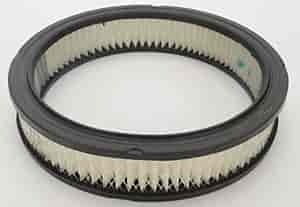 Heights of air cleaners are measured from the gasket flange to the top of the supplied retaining nut. Dimensions are accurate within 1/8". The Signature Series triangular air cleaner is a new style with a shape reminiscent of the muscle car era. This hot looking chrome air cleaner has the classic Edelbrock signature. This triangular air cleaner comes with high-quality 2-1/2" washable, pre-oiled cotton gauze filter for excellent filtration. Designed for use with 5-1/8" diameter carbs (Edelbrock square-bore, Q-Jet, etc. ), the Pro-Flo p/n 350-1222 clears HEI distributors and electric choke housings. Air cleaner dimensions: 14-1/8" wide x 13-3/8" long.